The Austin Kégresse was one of only two armored half-track models developed during the war by the Russian. The concept seemed tailor-made for this humongous country, almost devoid of roads and on which the existing roads were plagued by deep snow in winter, heavy dust in summer and deep mud in between. Nevertheless, based on the local-built Austin-Putilov chassis, the half-track concept was embraced by the Tsar himself, who had one such vehicle in his garage. But despite its promises, the half-track concept never really resurfaced in Soviet designs, being replaced by the Christie system using convertible roadwheels. Ironically, the Germans, French and Americans soon saw the potential of the formula and embraced it. Russo-Balt C24-30 belonging to the Tsar’s garage, designed in 1913. The concept of light rubber tracks matted with an adequate bogie suspension system was invented by Adolphe Kégresse, a French military engineer, also inventor of the dual clutch transmission. 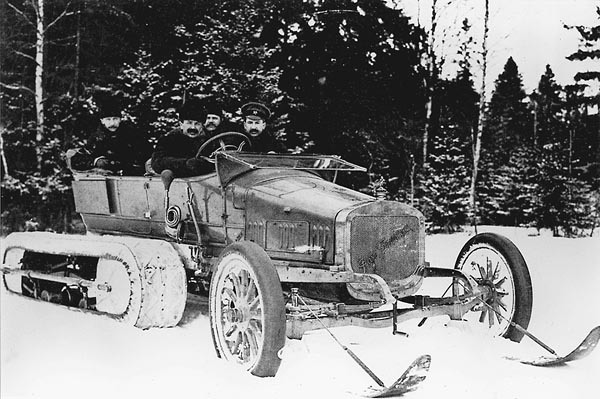 He moved in 1905 to Saint Petersburg, improved the imperial car park, and created the first private half-track car for the Tsar, which also had skis mated on the front roadwheels for the Tsar’s winter hunts. The “Russo-Balt “C24-30” was followed by a Packard Twin-6 with the same system, and eventually the wartime Austin-Kégresse. Austin-Kegresse «Ukrainets» in Zhytomyr, 1920, Polish-Rusian war. The vehicles were converted from some of the Austin armored cars assembled locally at Putilovski Works, Saint Petersburg. However, production was halted by the 1917 October revolution, and resumed in March 1918 under supervision of the Red Army. 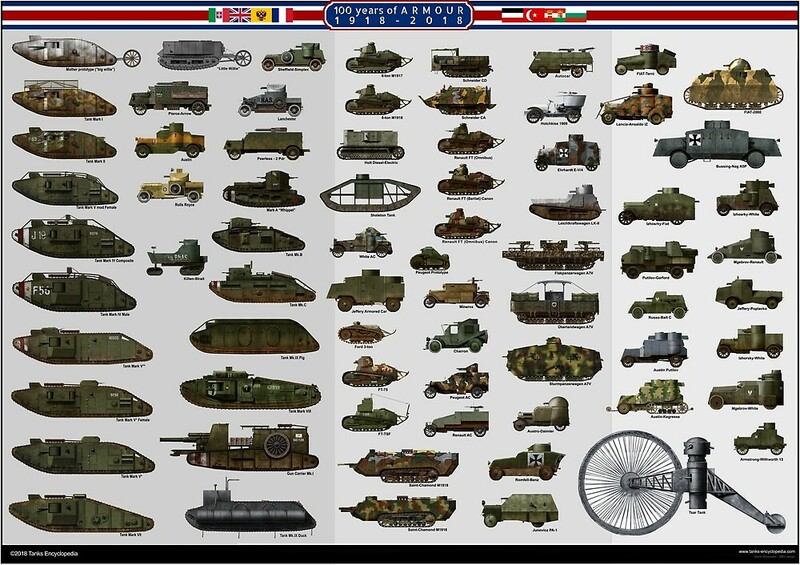 33 Austin-Putilovs were ultimately built before 1920, and 12 of those were converted to the half-track system. The hulls were identical to the regular Austin-Putilovs used by the Red Army, but the Kégresse system replaced the rear axle, comprising an articulated bogie with a large drive wheel at one end and and idler at the other and. Several small guide wheels were in between. The tracks were made of reinforced flexible rubber belts with metal treads that gave a better grip. Thanks to this, traction was excellent on all soft grounds, but the system barely tolerated high speeds and was quick to wear. The total weight was 5.8-5.9 tons, road speed about 25 km/h (15 mph) and road range 100 km (60 mi). In addition, there were roller arms at the front and rear of the front axle and tracks, allowing the vehicle to climb vertical obstacles or trenches with ease. 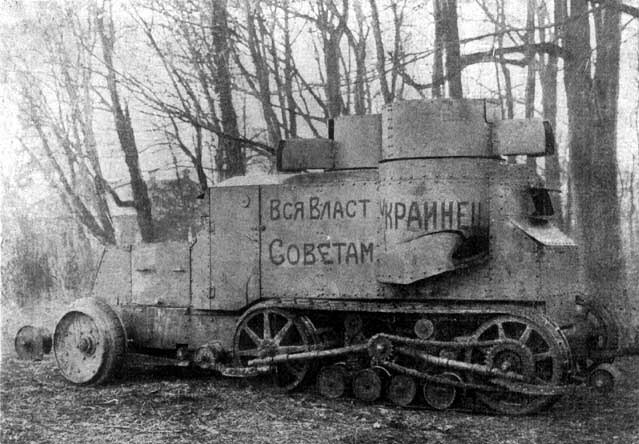 As stated before, the Austin-Kégresse, or Putilov-Kégresse, was only used by the Red Army, as all 12 were delivered between July 1919 and March 1920, due to the lack of spare parts. 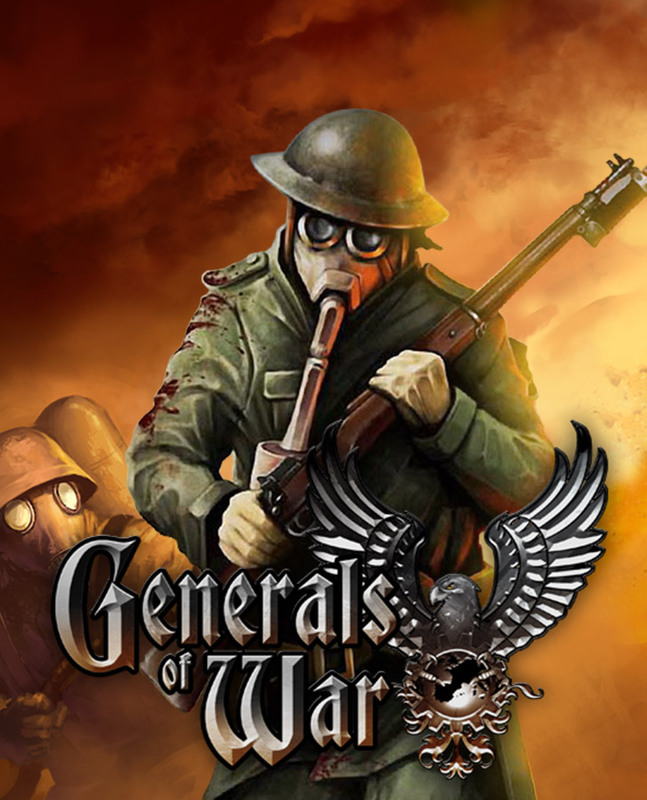 They participated in the Civil War against the white Russians, and the Polish–Soviet War in 1920-21, where most were destroyed or were never repaired due to a chronic lack of resources in the 1920s.